Varese, 2nd November 2017 – Throughout MV Agusta’s history, racing bikes and production models have always been closely entwined. 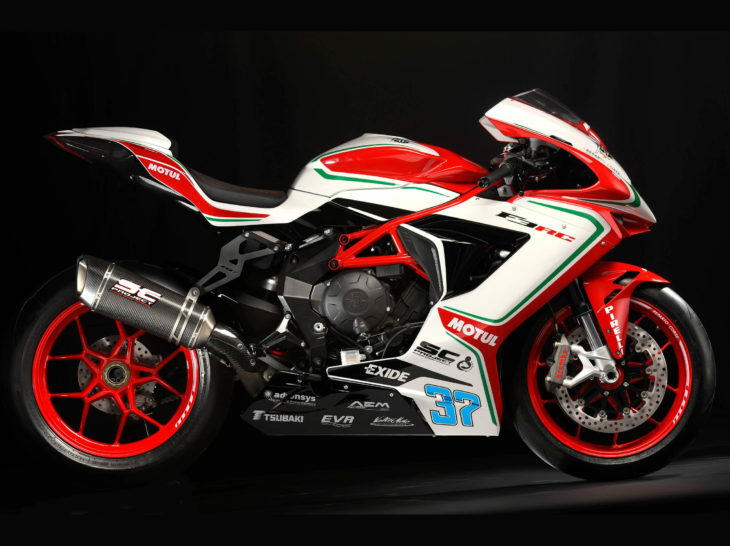 A fact highlighted by extraordinary successes, such as the outstanding results achieved by the Italian manufacturer in recent years in the World Superbike and Supersport championships. Ever since the F3 was first conceived, engineers, designers and the racing department have worked as a compact team: the chassis, engine and electronics have been developed with the dual goal of winning on track and bringing the unique thrills of a race bike to the road. The gearbox has undergone a complete overhaul to make shifting easier and reduce clutch lever effort. Exhaust manifolds have also been redesigned, while the F3 RC silencer – supplied by SC Project – derives directly from the unit used by the Racing Department. Each of the 350 limited edition F3 RC bikes comes with a top-drawer kit that boosts bike performance even further, effectively making it identical to the race version in terms of equipment and appearance. In just a few simple steps, the kit can be used to transform the F3 RC road bike into a perfect track day machine. The titanium exhaust system, with carbon fiber silencer, is supplied by SC Project and comes complete with carbon fibre heel guard and aluminium silencer support brackets. Also included in the kit is the electronic control unit with a dedicated mapping to maximise the increase in performance (133 hp at 14,570 rpm on the F3 675 RC and 153 Hp at 13,250 rpm on the F3 800 RC). The rear seat cowl (for single- seat use) adds a touch of eye-catching style, as do the machined from billet brake and clutch levers. The included rear sprocket is for race track gearing, while the rear stand and bike cover are for maintenance purposes. As proof of its uniqueness, each RC comes with its own certificate of origin. As nice as these are I wouldn’t buy one. They are missing what for me has been the trademark of the MV triples: the exhaust switching from 3 exit pipes down to a more traditional design. I’m sure it is more efficient and/or probably necessitated by Euro 4 compliance but in this case I think I’d go with style over substance and stick with a previous model or maybe a Brutale. I’m far too practical for something like this, but it’s gorgeous! Motorcycle exotica for the well heeled. I do not like that headlight. How is that for a list of complaints. Lol. Never ridden one, but it sure looks good. Great looking paint-job. Interesting choice to “black out” significant portions of it. I prefer that to the multi-piece strategy that the Japanese bikes employ to similar effect (accent lines in spaces where they want). 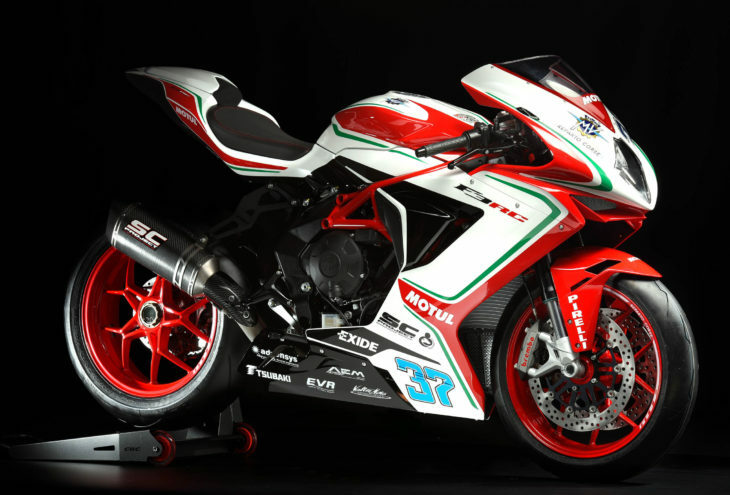 MV continues to make the most beautiful bikes to come out of Italy…by far! While I’m too old to fit on that bike for a ton of miles, it sure as hell is good looking. What a gorgeous bike! Can’t think of any design in the last 10 years or so that has filled me with such instant moto-lust. Red/silver MVA F4 1000 was one of the most beautiful motorcycles ever produced imo. This one is gorgeous too, but that red/silver was my personal fave. “133 hp at 14,570 rpm on the F3 675 RC” with the Kit from “28 hp (94kW) at 14,500 rpm”; so around 4% increase in hp? Probably the cheapest way to increase the 675 power is to buy the 800 instead.